Is that Mold or Mildew? What You Want To Know! When did you first learn about mold? Most likely back when you were a child in school. There are many experiments that can be fun and exciting when it comes to mold. Doing one in your home however is not something that anyone wants to take part in. Everyone has found forgotten leftovers in the fridge with more colors than a crayon box. It’s not at all uncommon to find an orange turn green overnight with mold growth or that bread that was left out a little too long to start getting spots. When we see it growing on food, there is little concern other than to throw it out (sometimes the container too). We have come to accept that mold has a purpose which is to bread down organic matter. What is not acceptable is when that thing it is breaking down is our homes. Mold in a home can cause material and structural damage as well as posing a possible health hazard. Do you know your mold facts? Mold needs moisture to grow. Outdoors, mold grows in the soil, on vegetation and on decaying materials. Indoors, mold thrives in damp, moist conditions like bathrooms, basements or even behind the drywall when there’s been water damage. Mildew is mold. That white-gray, powdery stuff that sometimes appears on the leaves of plants is mildew, an early stage of mold. There are four common types of indoor mold: alternaria, aspergillus, cladosporium and penicillium. Often, mold found in a home appears greenish-gray, brownish-green, gray and even black. You may find slimy green mold on the exterior growing on vinyl siding located in an area that receives little to no sun. This mold usually can be removed with a power washer. Mold, a fungi, spreads by spores, which act as seeds to form new mold colonies. Some mold spores do contain toxins that can cause health issues when inhaled. People with mold allergies, pregnant women, anyone suffering from asthma, has a compromised immune system or respiratory conditions shouldn’t be exposed to mold. This is why mold remediation by professionals is essential. Reactions to mold may include, but are not limited to, headache, fever, cough, wheezing and flu-like symptoms. It can trigger asthma attacks as well. The terms “toxic mold” or “black mold” refer to Stachybotrys chartarum. Typically, it’s greenish-black in color and develops after a space has suffered heavy water damage. It, and all other kinds of mold, needs to be removed safely by professionals trained in mold removal. Mold on a shower curtain or in the tile’s grout around a tub can be removed by a homeowner. Bleach removes mold, but remember to only use it in a room that’s well-ventilated. Also, some types of tile will etch with bleach contact, so make sure to spot check the bleach before using around the entire tub. Running a bathroom fan can help reduce the development of mold in the room. Open glass shower doors to allow ventilation and never bunch a shower curtain, instead keep it open so it can dry thoroughly. Remember, mold needs moisture for growth. A musty, mildew-y smell in the basement is not natural. It’s likely mold due to water damage, a cracked foundation or leaking pipes. If that musty, mildew-y smell is present in your home, it’s important to locate the source of the smell or the location of the mold. For mold growth in a residential home, the CDC does not recommend mold sampling or testing. Keeping indoor humidity levels below 45 percent can inhibit mold growth. Condensation on windows, walls and other hard surfaces is a sign of high humidity in the home, which increases the risk for mold development. 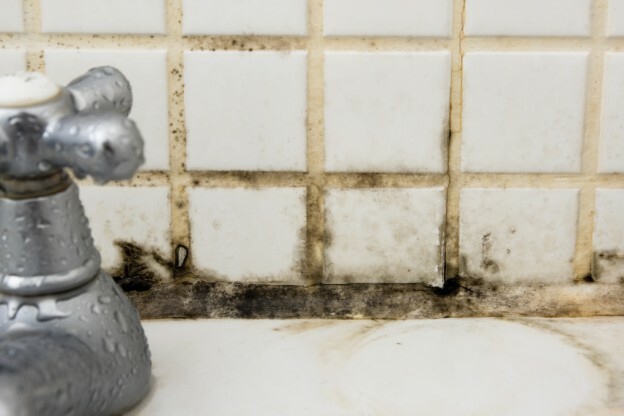 After a water damage event (flood, burst pipe, firefighting efforts), mold can begin to grow as soon as 24 to 48 hours. Mildew, a type of mold, easily develops on cardboard, books and even fabrics. Store old clothes and other items in water-resistant containers instead of cardboard boxes to reduce the risk for mold growth. After a home flood, mold can grow in many unseen places including behind drywall, within insulation, on carpet padding and even throughout the HVAC system. Adding mold-inhibitors to paint before painting can reduce the potential for mold growth. ServiceMaster Restore® offers complete mold remediation servicesperformed safely and effectively by professionals.